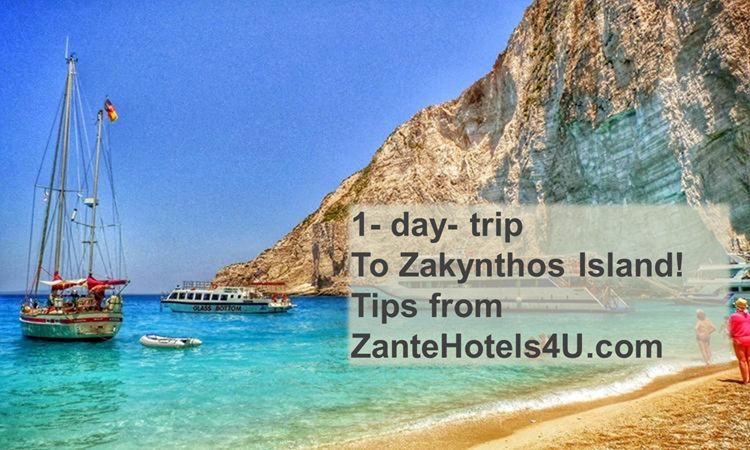 Zakynthos Travel Guide: 1-day-trip to Zakynthos Island! 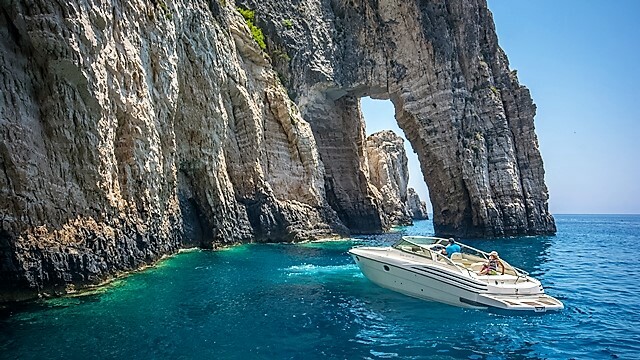 Zakynthos Island can be either a stop for a short time or a middle destination during a cruise or a tour round the Greek islands. 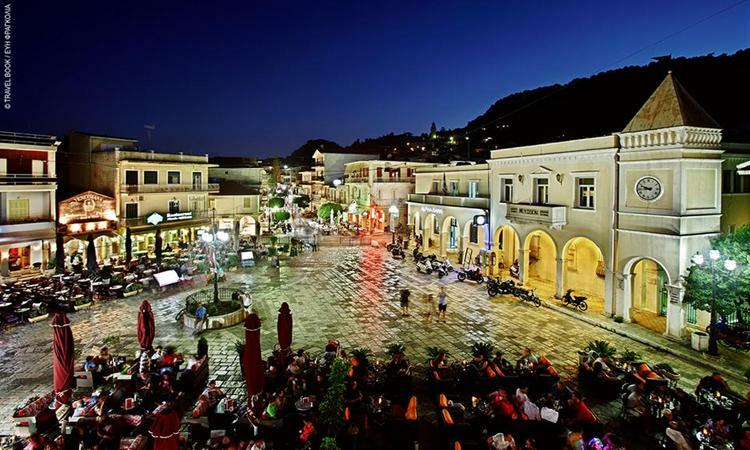 We, as locals have some suggestions to make so that a short visit on Zante Island can be converted into an unforgettable experience! 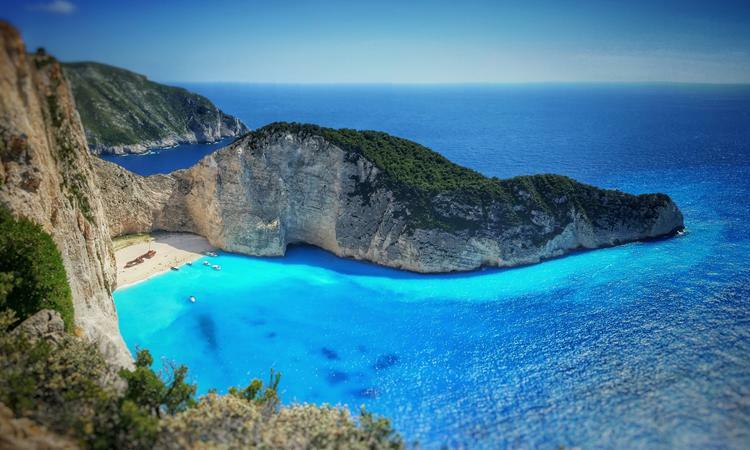 The absolute must of Zante is the world famous Navagio. This beach with the dark blue sea water that looks like a huge swimming pool is accessible only by boat. The stop at this unique beach which is surrounded by imperious rocks lasts for about one hour. Thus, you will have the chance to take the best “selfie”, enjoy the sun and swim in this magic sea water. During your return there is stop at the Blue Caves. Most of the Zakynthian beaches have sea water in light blue-green color but, here at the Blue Caves the water is dark blue. Actually early in the morning as the light of the sun reflects, the rocks, the bottom of the sea and everything that is under the surface of the water are ‘’painted’’ blue. 1. Explore Shipwreck by car! 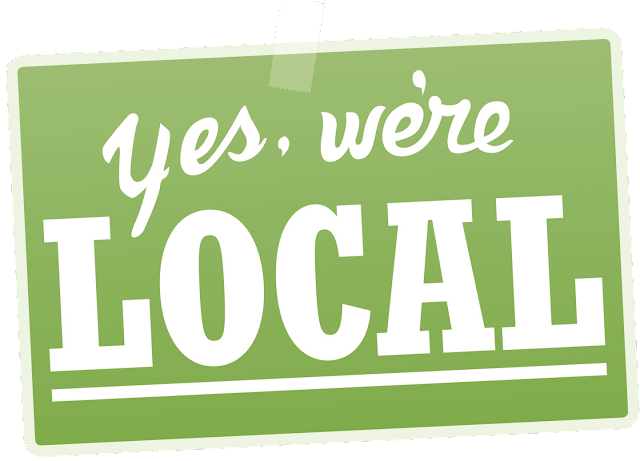 A local will take you around! This trip takes a lot of time to be done but there is a great advantage comparing with the above trips. You can see the Navagio from above and by boat. The view from the platform situated above Navagio is breathtaking plus you will have the chance to take unbelievable photos! The duration of the trip depends on the places you wish to see. The price for the route in the car is € 230 for 1-2 persons. The driver, water and coffee is included in the price. The cost of visiting Navagio and the Blue Caves is included in the price of the trip in the car. - Do not forget to take with you a hat, sunglasses and sun tan lotion with high protection! - Put on your swimsuit! - Get with you some plenty of water and a snack! 2. VIP Private Luxury Yacht Trip Around the Island | The Absolut on Board Experience! The luxurious boat stands at Zakynthos port with the crew ready to welcome you. A glass of champagne accompanied by a variety of local cheeses and prosciuto are at your disposal during the trip. The boat sets sail from Zakynthos harbour. The first stop takes place at Xigia the beach with the spa sea water. 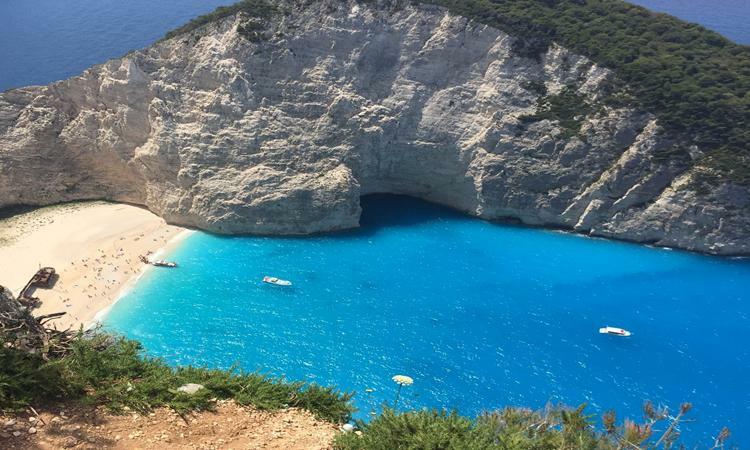 Then we continue towards the picturesque port of Saint Nicolas to reach the Blue Caves for a quick swim and finally arrive at the Famous Navagio (Shipwreck Beach) where we enjoy the crystal blue sea. The cruise goes on as the boat sails towards the Keri Caves and Marathonisi Island where the remarkable Caretta Caretta turtles lay their eggs. Capacity of the boat is 1-10 persons. *There is also a option of the boat Annita with the capacity of upto 16 persons. 3. VIP Private Luxury on Board Romantic Sunset Viewing at Keri! A glass of champagne accompanied by a variety of local cheeses are at your disposal during the trip. The vessel sets off at 18:00, sailing along the shore and admiring the beautiful landscape we reach the Mizithres Rocks at Keri Area. We stop for a swim in this unique scenery and then we enjoy a glass of cool champagne. 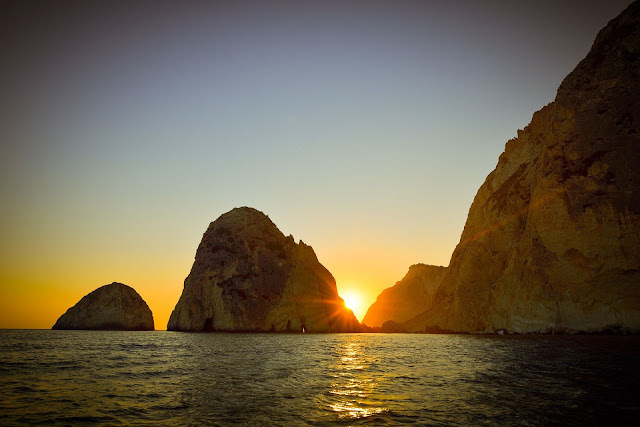 The sight of the two rocks that stand imperiously is amazing while the sun sets and the sun rays touch the surface of the blue sea. The second most picturesque sunsets is just in front of you. We sail back to the port at 21:00 having gained an unforgettable experience. Capacity of the boat Erieta is 1-10 persons. 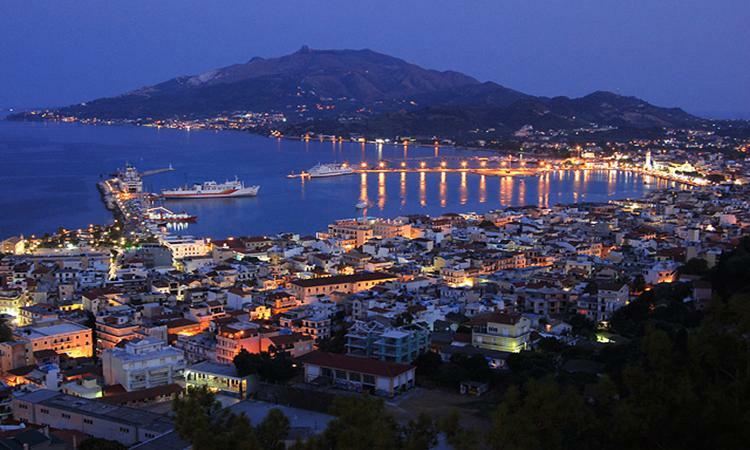 After your trip depending on your mood you can go for a walk to Zakynthos Town, the capital of Zante Island. There are lots of cafes, restaurants and gifts shops to look around. We recommend you “Spaghettomania” for a meal or “Varkarola’’ where you can also listen to kantades, the traditional Zakynthian songs. For families we suggest to have a coffee or ice-cream at "Kokkinos Vrahos’’ a café that has port view. Children can play in safety at the square in front of the café. - "Latta’s": a special café where you can try ‘’frigania’’ a traditional sweet with ice-cream. - "Diethnes" an amazing open air café that serves coffee, ice-cream and cool cocktails. 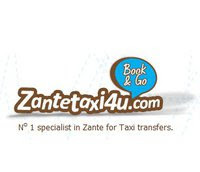 - "Movida: a club to listen to music, dance and enjoy a drink, if you decide to stay in Zante for the night. Most of the photographs presented have been taken by Mr Alistair Ford. Alistair loves Zakynthos island and comes every year. More photos of him can be found on the page Zakynthos Island Images.